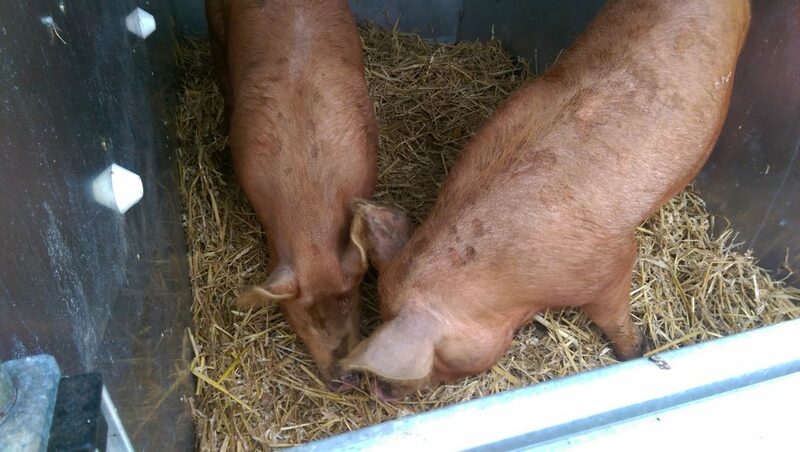 At just over 8 months old, the big day had finally arrived for the first of this years pigs to go off to the abattoir. There are 4 from the first litter and they all looked pretty good when I checked them over for the last time. 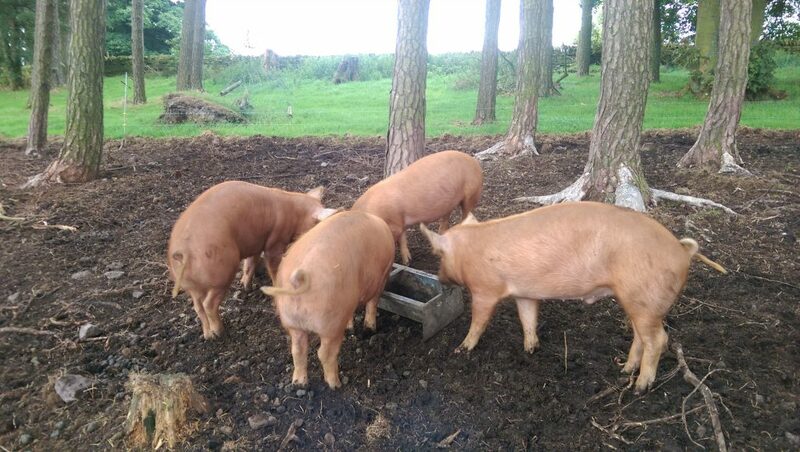 It’s been almost 2 years since we last sent any pigs off to slaughter so a quick look back through old posts on this blog proved to be extremely useful. The very first post about weaners brought back some happy memories and reminded me exactly how we’ve come in the last 4 years. In the end I’m happy with the 2 pigs that were picked and at roughly 80kg live weight they should give us some great pork. It will definitely be interesting to see whether I’m getting any better at judging the quality of the meat and the amount of fat when looking at live pigs. A quick dry run the night before to get them used to boarding the trailer went as smoothly as I could have wanted. On the morning of the trip they were just as happy to get on board and have a small snack before the journey. However once the food had all gone they got a little sneaky and tried climbing back out of the trailer after I’d closed it up. Luckily a disaster was avoided just in time but I had to give them a stern talking to. The remaining 2 pigs from that litter will be kept on until they get to about 90kg or more which is a suitable weight for producing bacon. With luck this will fit nicely with our planning for them to head off to the butcher some time in October. The advanced sales have gone very well via social media so we’re not entirely sure whether there’ll be much left from these 2 pigs for ourselves. Luckily there are still more pigs to go so I’ll make sure I set aside some of that for us at Christmas. Now there’s just the small matter of picking up all that pork from the butchers at the end of the week and then dealing with the various collections or deliveries. It helps to be organised with lists and contact details but I’ll need to check everything during the week just in case I’ve misplaced an order!